Screen and/video captures can be an important aspect of any production environment. Apple provides a limited image capture tool incident to OS X, and there are shareware screen capture utilities available on the Internet. 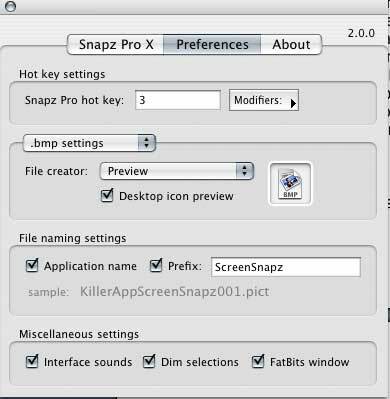 SnapNDrag, for instance, is a freeware screen capture utility more robust than Apple's built-in keyboard sequence. (http://www.yellowmug.com/snapndrag/). Others, such as Screen Catcher and ScreenRecord are available for free or a small shareware cost. (http://graphicssoft.about.com/od/screencapturemac/). Most provide good static screen grabs for limited use. Recording screen movements in OS X is an entirely different issue for those of us who produce tutorial CDs or DVDs or have similar uses. In most cases, recording via a scan converter has been the only, and pricey option. 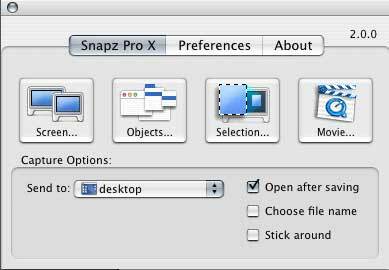 However, Ambrosia Software's release of an OS X version of its classic SnapZ Pro capture tool has changed the equation. Ambrosia claims that its movie capture option is 20 times more powerful than others available. While I couldn't independently verify the claim, I am impressed with its capabilities, particularly on a fast DP G5. Mileage may vary with less powerful OS X configurations. This complete rewrite takes full advantage of the power of OS X, adds new functionality to the OS9 version, and provides an excellent alternative to expensive scan converters when capturing full screen video ­ even, in my case, a full screen 30 fps capture of a Final Cut Pro session. Installing the Snapz Pro X adds it to your startup items, which has both an advantage and disadvantage. First, the app will always be available with a preset or customized hot key combination. The negative is that the app is always running in the background, which could cause some concern for any video production environment. However, the app utilizes virtually no system resources, and did not provide any discernible interference with any of my FCP or DVD SP sessions. If it still bothers you, however, you can eliminate it as a startup option in your Accounts pane, and then manually launch whenever you wish. A second issue deals with an audio kernel extension that permits you to capture your Mac's built in audio output. I contacted Ambrosia to determine if this would interfere with either Soundtrack or FCP, and was assured that it would not. The only way it may cause a problem is if you have SP X 2 set to capture the Mac audio, which would mean no other application would be able to grab the audio at the same time. This isn't a likely case, however. Launching SP X 2 produces the following screen that controls captures of the screen, objects (menus, etc), selections, and movies. You can elect where the files are stored, and how you name each file, or have it done automatically. The preferences section includes settings to establish hot key launch combination, file naming conventions, what application will launch the captured file, and various settings for how SP X 2 interacts. Make certain you turn off the "interface sounds." It can get annoying. 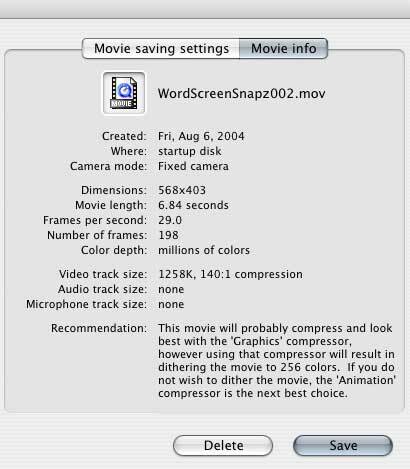 Electing the "Movie Settings" produces a number of options to control movie captures of your Macintosh screen. Once the Movie option selected, a highlighted area of the screen appears. The selection can be resized by grabbing the sides or corners, and moved by clicking inside the highlighted area and dragging the selection tool. You can also set the capture target manually. There are drop down menus that control the aspect ratio, size, frame rate, scale, and camera mode of the onscreen movie capture. If you check the microphone box, SP X 2 records your narration using an external or built in microphone. You can capture any built in audio that your computer may be outputting. 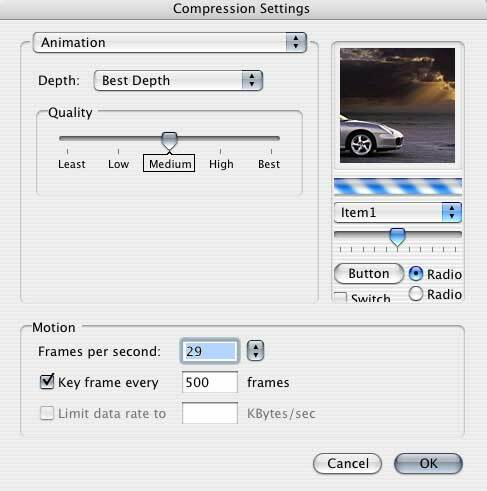 There is another option to smooth video capture if you're not getting the motion you require. The manual provides an extended explanation of this option. You may also set the movie capture to follow your cursor, produce a "smooth pan" while following the cursor, or to use a "fixed camera" to capture the screen. Another option allows you to scale your capture from 10% to 400%. Once captured, you can elect what video codec you wish to output, and at what depth using the normal QuickTime video save dialog box. You can also view the move setting pertinent to the movie you've just captured. Various capture options have been expanded for still screens as well, including the capability to grab single and multiple menus. You can save in multiple formats including bitmap, portable document format (PDF) and native Photoshop. More accurate capture is possible using a magnification feature with pixel-precise targeting, and a capture preview that dims areas of the screen not being captured. 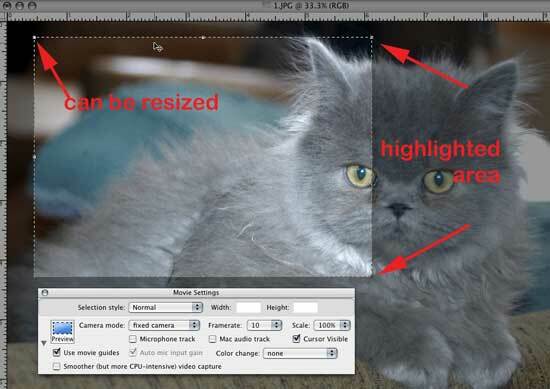 This should eliminate the need to clean up the images in Photoshop. You can capture with various borders, elect square, rounded, or normal windows, and capture with various fades and drop shadows. There are literally dozens of settings for each of the capture alternatives that govern final output. Although SP X 2 is fairly intuitive to use, the supplied 54-page PDF manual is fully illustrated with "getting started" and detailed instructions on how to use the application. It discussed the options and settings available for each type of capture and suggested optimum settings depending on intended use. If there is one negative to SP X 2, it's that you cannot use it to capture its own images. To get some of the screen grabs for this article, I resorted to Apple's utility. Some may find all this functionality to be easily worth the price of $69.95. With the newer movie capture capability, and the seamless interfacing with OS X, I would have to agree. If you just do occasional screen grabs, Apple's OS X utility or a shareware app like SnapNDrag may be all your need. But for sheer breath of capability in excellent movie capture, Snap Z Pro X with movie capture is your best choice.